Noise levels - What is Noise? A simple definition of noise is: Any unwanted sound. Noise is measured in decibels and the scale often employed dB(A) is weighted to the range perceived by the human ear. 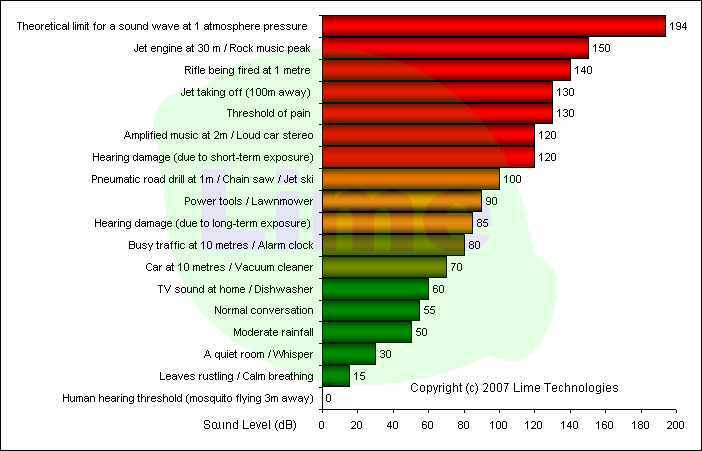 The decibel system is frequently misinterpreted as it is based on a logarithmic scale. This means that a sound level of 100dB(A) contains twice the energy of a sound level of 97dB(A). A rise of 10 dB in sound level corresponds roughly to a doubling of subjective loudness. Therefore a sound of 80 dB is twice as loud as a sound of 70 dB which is twice as loud as a sound of 60 dB. Correspondingly, the 80 dB sound is 4 times louder than the 60 dB sound. The table below illustrates the impact of changes in noise levels. Distance plays an important role in the perceived sound level. Sound levels decrease by approximately 6 dB every time the distance from the source is doubled. Sound levels inside a property will be approximately 10dB less than those outside, even when a window is open. In order to prevent disturbance to nearby residents, entertainment venues should fit one of the products below to control sound levels from bands / DJs etc.